Laura Ingalls Wilder, author of the Little House on the Prairie series, drew us to De Smet, South Dakota on this summer’s road trip from Ohio to Montana and back. When you’re driving through South Dakota, what’s a 100 miles or so detour from an interstate highway? Besides, De Smet SuperDeluxe Inn & Suites promised a night of restful slumber so the extra miles on the road seemed no big deal. As per our normal routine on our road trips, we rolled into De Smet Super Deluxe Inn after 1o p.m. with several hours of driving behind us. Instead of staying in the double queen I had booked via the hotel’s website, we were upgraded to a king suite. The folks who had stayed in the double we were to stay in had decided to stay one more night, thus our good fortune. Our king suite, in this 37 room hotel, featured two rooms, one with the king bed and another with a sofa bed. Instead of opening the sofa bed for our son, we set up the rollaway single bed we found standing up tucked behind the bedroom door. It was easy to roll into the living room so the sofa bed could remain a sofa. 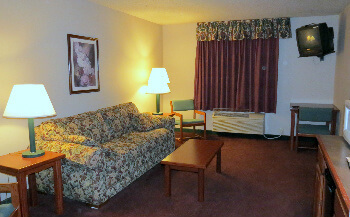 Our king suite was clean, spacious, comfortable and quiet, and the decor more down-home living room than corporate. The suite also had a microwave and refrigerator. 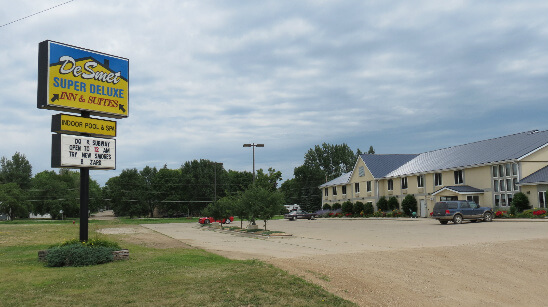 Along with delighting in the upgrade, we enjoyed our stay at the De Smet Super Deluxe Inn because of the hospitality of the staff who gave us directions to Laura Ingalls Wilder sights and provided other tips about the area. 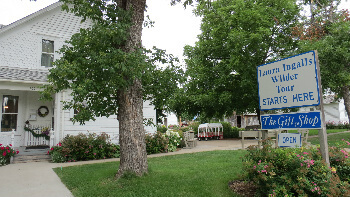 The hotel is within walking distance of start of the Laura Ingalls Wilder tour that includes the Surveyor’s House where Laura lived with her family when they first arrived in De Smet, the one-room school house attended primarily by Laura’s sisters Carrie and Grace, and a replica of the one-room school house where Laura taught. Before embarking on our Laura Ingalls Wilder tour that included the town of De Smet, we lingered in the breakfast area that doubles as a lobby. The continental breakfast included make your own waffles, several types of breads, donuts, and cereal. With hours to drive to Chicago there was no time to swim in the hotel’s indoor pool or take a spin on the exercise equipment in the work out room. Before we left the hotel, we picked up a map of De Smet that points out De Smet’s landmarks that are mentioned in Wilder’s books. Do take time for the cemetery a little out of town. Laura Ingalls Wilder’s parents and sisters are buried there as well as several of the people who make an appearance in The Long Winter, Wilder’s book in the series that chronicle of one of South Dakota’s worst blizzards in history. Because of De Smet’s size, the Super Deluxe Inn is one of only lodging options in the area, however the Heritage House Bed and Breakfast in downtown De Smet looks fabulous. 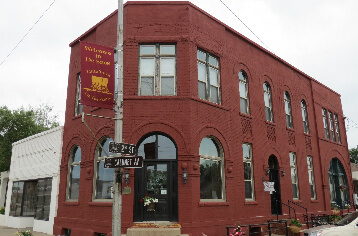 This two story building built in 1888 once housed a loan and investment company and a bank. While I was looking for a room in De Smet before our trip, there wasn’t a room available for three people at the Heritage House Bed and Breakfast. 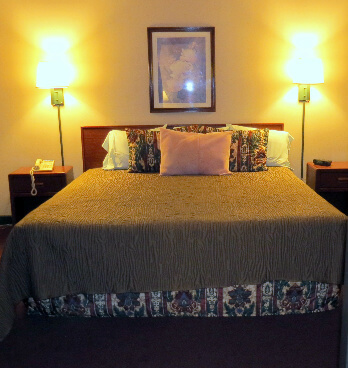 For our needs: a clean, comfortable place to stay after a long day’s drive before another long day’s drive, De Smet Super Deluxe Inn was perfect. I would like to return to De Smet one day, so perhaps we’ll put elegant ambiance steeped in history on our slumber menu for visit number two.